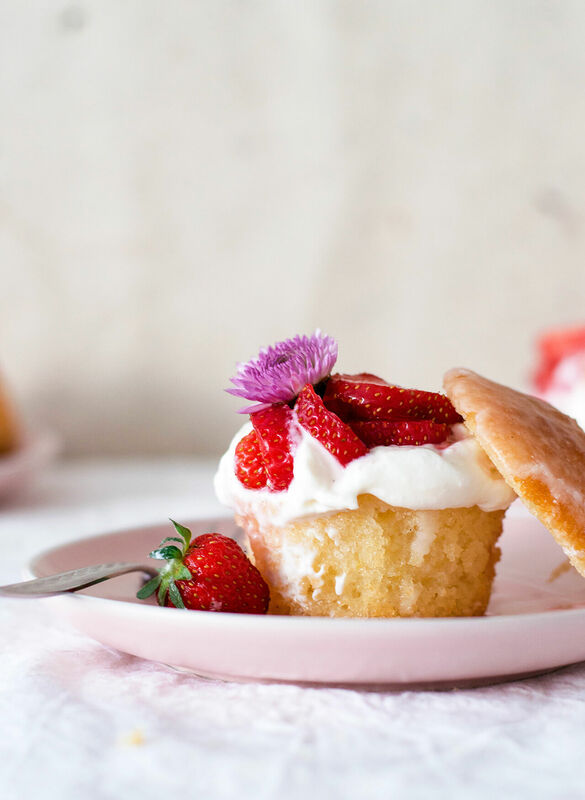 These whipped ricotta lemon muffin cakes with fresh strawberries are a feast for your eyes and your belly! Simple to make, elegantly messy and impressive. Okay, I have to tell you something: If April was very hot, then May is just right. I know so many people will disagree with me on this, but hey… I’m not “so many people”. We’ve had a lot of rain this past week or two and I’m loving it. And while I’d normally reach for something more cozy when it’s chilly, I have to say I’ve been buying berries regularly all this time. I get excited for strawberries every Spring and this year is no exception. 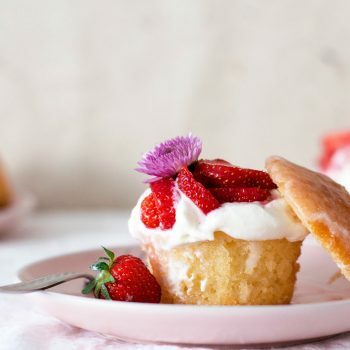 I wanted to make something really simple, something I could eat fresh strawberries with and these whipped ricotta lemon muffin cakes totally hit the stop. You know by now how much I love simple loaf cakes (like this kiwi lime cake or this winter citrus cake) and I got it into my head that these cakes could be baked as muffins. And when I say that I mean literally baked in muffin form, so you still get that pound cake texture but it comes in muffin shape instead. So that’s what I did. I decided not to play with the basic recipe so much and just go with it. 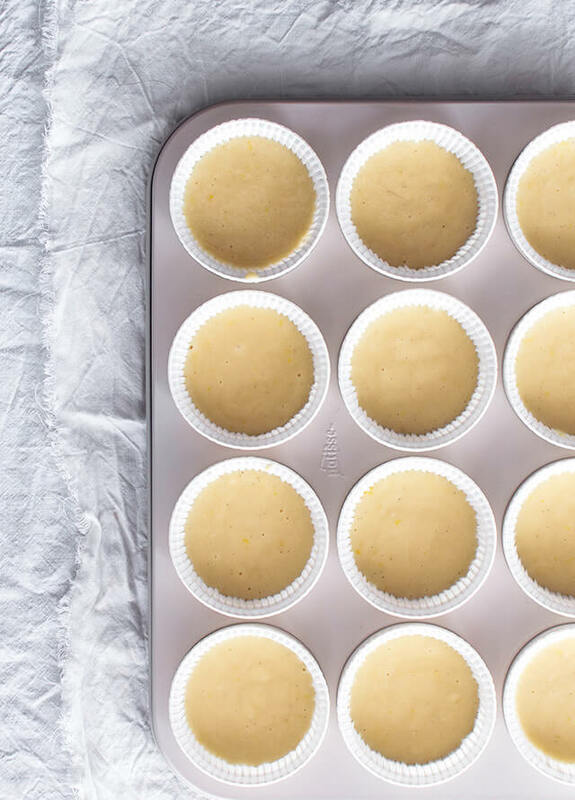 What you get are the perfect, soft lemony muffins, glazed with a lemon sugar glaze. 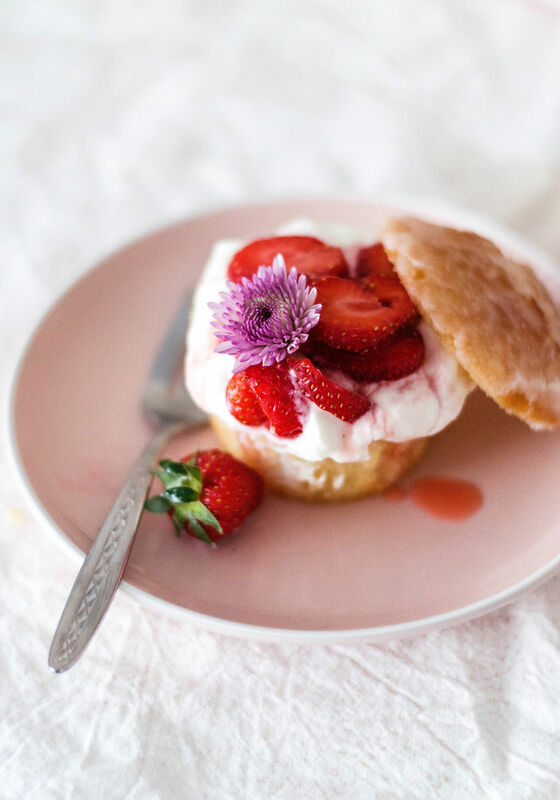 They make a great treat on their own, but are even better with whipped ricotta and strawberries. 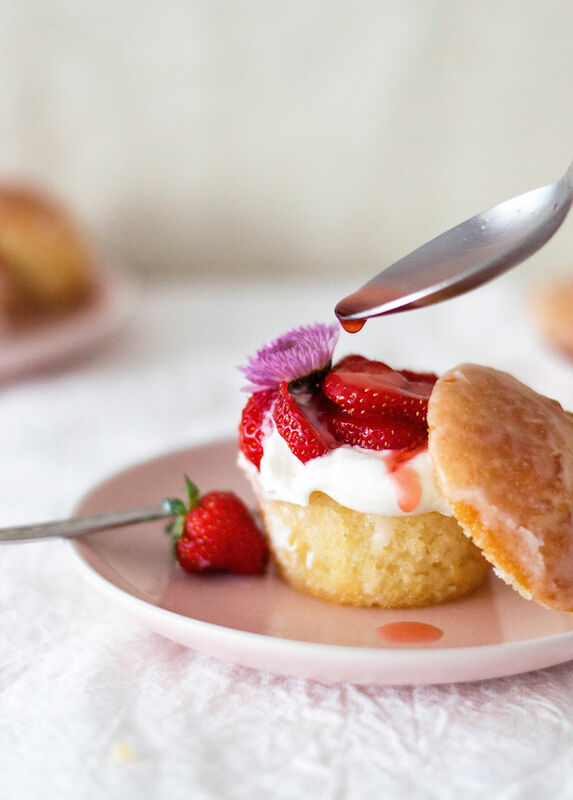 My favorite thing about these whipped ricotta lemon muffin cakes is that they look like shortcakes, but taste more like a proper cake. As you can make the muffins ahead of time, these are also perfect for gatherings, potlucks and so on. The whipped ricotta is an absolute jewel. It’s similar to the orange infused ricotta from this recipe, but a bit upgraded. I make it with lemon zest instead and also add some whipped cream to it. The reason for that is that I just wanted something fluffier from classic ricotta. It fits better into these muffin cakes, as the base is a bit dense, so you want something fluffy on top. And then come the strawberries. Of course these whipped ricotta lemon muffin cakes leave the berry door right open. Meaning that you don’t have to choose strawberries if you prefer other berries. You can also use a mix, which I think would be really wonderful. Pretty little red and deep purple jewels scattered on top. I like that. But like I said – I’ve been really into strawberries lately. Instead of chopping them, I opted for a simple slice. I like how the strawberry disks match the muffin shape. It makes the whole dessert a bit more uniform in my eyes. Once again, you can change this too and simply chop the strawberries into little chunks. 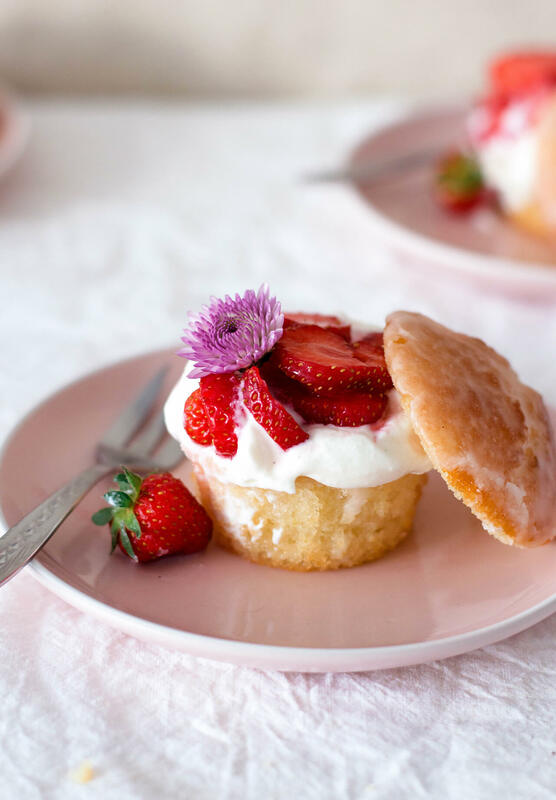 The whole point is that once sliced and sprinkled with sugar, the strawberries release all their juice which really brings the whole muffin cake together. 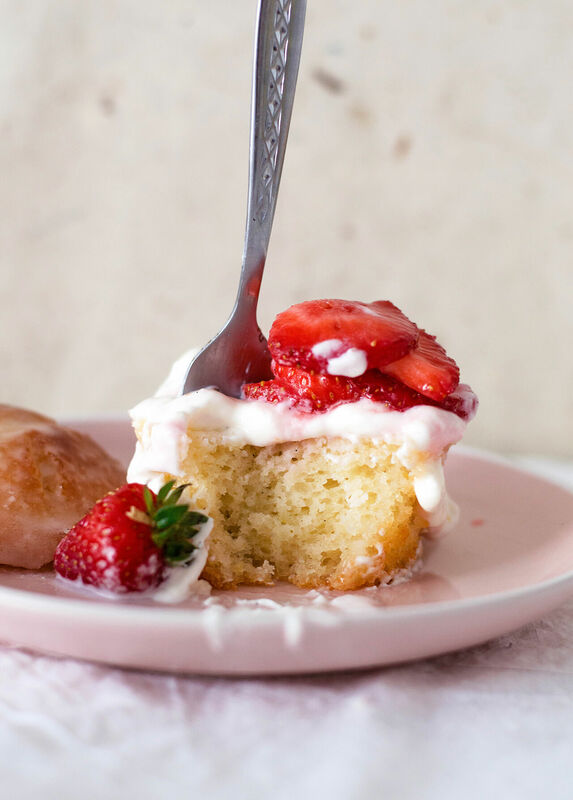 Because as much as I love a simple cake, we all know that frosting and syrup are what can take a cake to the next level. 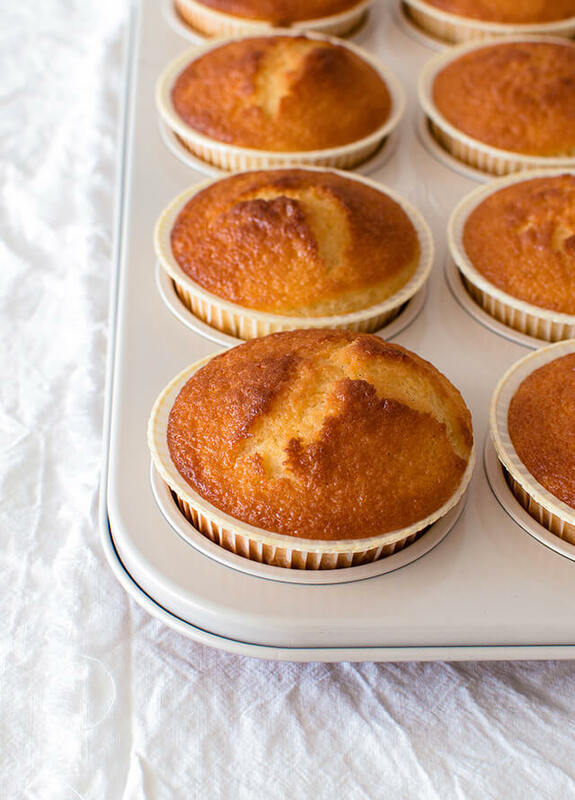 All in all, I have to say that these whipped ricotta lemon muffin cakes are SUCH a treat. They’re packed with lemon flavor, they’re easy to make and once presented look pretty impressive and cute for how simple they are. 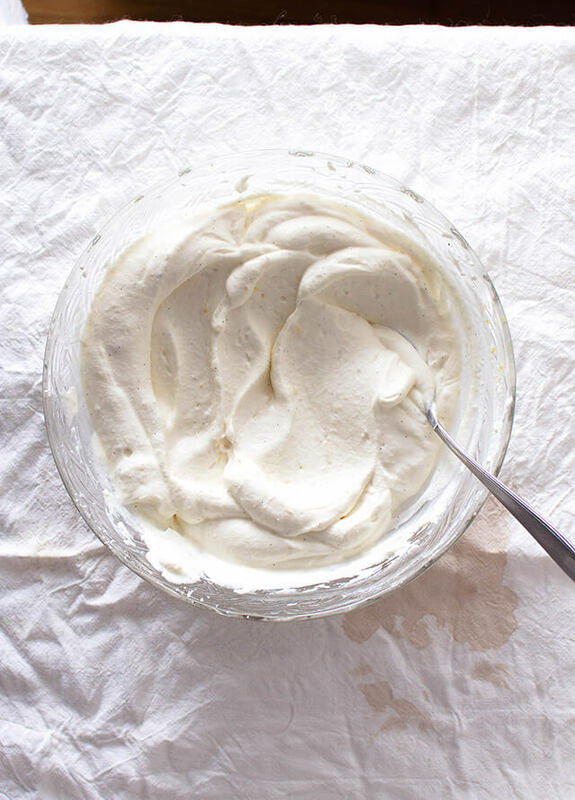 The whipped ricotta is a nice change from the otherwise traditional frosting options. And the strawberries? Well, they hardly need any selling, do they? Tis’ the season after all. Moist muffins cakes packed with lemon and loaded with whipped ricotta, that create a simple yet impressive dessert! Can be made ahead. First make the muffins: Preheat oven to 180°C (350°F) and line a 12-cup muffin tray with paper liners. Set aside. Sift flour, baking powder and salt in a bowl, set aside. In another bowl, whisk yogurt and sugar until smooth. Next beat in eggs one by one. Stir in zest and vanilla. Take the dry ingredients and slowly whisk them in until no lumps of flour remain. Lastly, fold in oil with a spatula. Keep folding until the mixture in unified. Divide batter between the muffin cups. Bake for 25-35 minutes or until the tops are light-brown and a skewer inserted in the center of each muffin comes out clean. Remove muffins from oven and let cool completely (if cooling overnight, cover them with plastic wrap or foil). When completely cool, you can glaze the muffins. Stir together lemon juice and powdered sugar in a small bowl. Take muffins out of their liners and place them on a cooling rack. Cover each muffin-top with a spoonful of the glaze. Leave out to dry completely. Combine ricotta, powdered sugar, vanilla beans and lemon zest in a large bowl. Cream ingredients together with a spatula. Next, place whipping cream in a bowl (or bowl of your mixer) and beat on medium speed until soft peaks form. Fold cream into ricotta, then keep beating for about 60 seconds until the mixture is smooth and forms firm peaks. Cover with plastic wrap and store in the fridge for one or more hours. 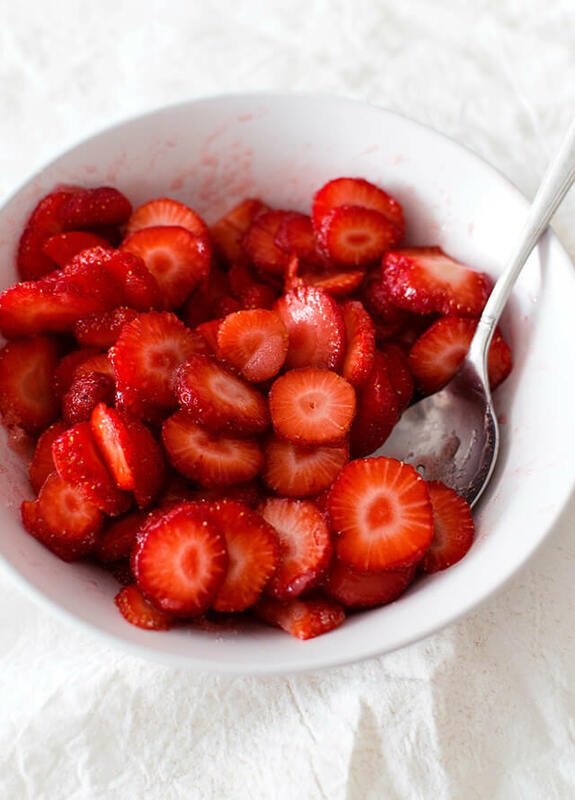 To prepare berries, combine strawberries and granulated sugar in a bowl. Keep like this, covered, until serving time. Stir before serving. Take a muffin and cut off the top of the muffin. Place the bottom piece on a plate, cover with a dollop of whipped ricotta, then add strawberries and some of their juice. Take the muffin top and lean it against the cake. Serve. This recipe makes a bit more of whipped ricotta than you’ll need for these muffins. You can use it up by dipping fruit in it, serving extra with the muffins or you can use it as a topping for pancakes. It will hold well in the refrigerator for about 2 days, as long as it’s covered. You can use other berries instead of strawberries, but don’t slice them.